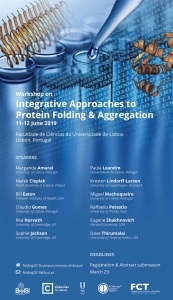 In the last decade it has become increasingly accepted that progress in the field of protein folding requires a close dialogue between simulation and experiment. The prospect of accurately assessing ever-larger timescales, as a result from progress on biomolecular modelling and simulation methodologies, opens up the possibility of using simulation to predict and interpret experimental data. On the other hand, the integration of experimental data with theory is critical for increasing the accuracy of force fields used in Molecular Dynamics simulations of biomolecules, and, therefore, experiments are crucial to improve simulations. Furthermore, the recognition that protein folding pathologies and conformational disorders (e.g. highly debilitating degenerative disorders like Alzheimer’s and Parkinson’s diseases, and metabolic disorders) have an increasingly strong impact in our society and economy, calls for a much closer dialogue between basic science and clinical investigation in order to achieve effective therapeutic solutions. The aim of this workshop is to bring together computational and experimental scientists with scientists doing translational research in order to foster the dialogue between the three communities so that novel and integrative approaches can be developed. Check here for information on invited speakers, deadlines and much more!